This is a glamorous, grown up coat from Coast, just as suitable for throwing over a beaded cocktail dress as it is for wearing with well worn jeans. I love Coast clothes as they always have the edge in terms of detail and finish. 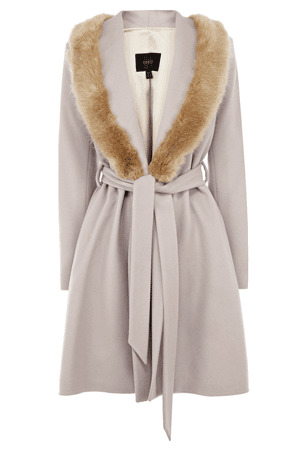 The Zabrina coat features a fur trim collar and a waist defining belt. The hem is slightly dipped with A-line shaping and the coat is fully lined. What I’d call an investment purchase, to be loved and cursed at for many seasons when you remember there are no buttons and the belt is the only way of doing it up. I’m always a sucker for fake fur.